Political Agenda — Are Singapore’s Hawker Centres Dying Out? Singapore’s hawker centres have been described as a “cultural institution”, a source of pride as much as a source of good eats. Yet the hawker industry is in crisis today, with rents and overhead costs rising even as hawkers are pressured to keep their prices down. 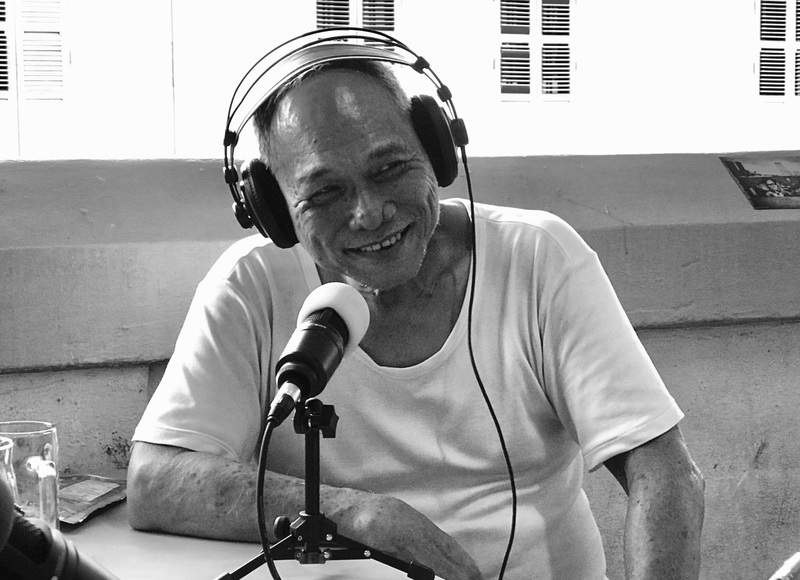 In this episode, PJ Thum heads to Chinatown Food Complex to speak to three hawkers, Jialiang, Yu Ting and Uncle Arthur, about the difficulty of surviving, not as cultural symbols, but viable businesses. Listen to our podcast below, but also check out these great hawkers’ stalls! All three stalls can be found at Blk 335 Smith Street Chinatown Complex, Singapore 050335. Yu Ting and her friend Alex serve up fusion Japanese-Italian food at Sutachi at #02-60. Uncle Arthur runs Chinatown Sun Seng at #02-61 serving up homely Singaporean and Chinese cuisine. While you’re enjoying all this great food, Jialiang will be at Smith Street Taps at #02-62 supplying you with craft beer to quench that thirst. You can also order chocolate truffles from him online at Demochoco. Thank you Jared for the transcript! Lim Jialiang: …a cultural heritage for intangible or something, something, something, something. PJ: And we’re actually sitting in the middle of Chinatown Complex in a hawker centre talking with three genuine hawkers who are going to tell us all about this today. I think hawker centres, hawker culture, the hawker industry, the food industry has been in the news a lot over the past couple of weeks. There’s been controversy over hawker centres over, you know, rising rents, social enterprises, and more broadly, I think Singapore’s… the hawker centres and their place in Singapore’s society, economy and culture. So joining us today, three hawkers who have their stores at Chinatown Complex. First up, Lim Jialiang, who sells craft beer at Smith Street Taps. He’s also a hawker centre enthusiast, who has a very deep and impressive knowledge of Singapore’s hawker centres and runs his own chocolate company, Demochoco. Hello Jialiang. PJ: How are you today? Jialiang: I’m drinking beer now, so very, very, very good. This is why I set up the meeting to be at Chinatown Complex, so I have easy access to beer. PJ: Right. Okay. And then also with us today is Mr Arthur Wong, who is very, very old school, so to speak. He started as a roadside hawker alongside his father at three or four years old at Eu Tong Sen Street. Hello Arthur! Arthur Wong: Yeah, a skill inherited from my father. So I still have, can be said, some followers. Or else ah, can’t survive. PJ: Can I just ask…. you started at three years old. How old are you now? Arthur: No, I’m not starting at three years old. My father started selling porridge when I was about three years old. Okay. Jialiang: Yeah, he started at ten years old. PJ: Wow. And you’ve been doing this your whole life and you moved here… you were a street hawker you said, and then you moved here to Chinatown Complex in 1983. And you’ve been here ever since? PJ: Wow. It’s a long time. Okay. And finally, last but definitely not least, Yuting, who has just actually started being a hawker. She started last December 2017… as of, well, we’re recording this in October 2018. So she represents kind of the other end of the spectrum, someone who’s very, very new to the industry. Hello. Welcome, Yuting. So you used to be an auditor, you said? Yuting: Yes. Previously an auditor for about six years. But, um, my interest in food brought me here and I decided to set up a hawker stall with my friend Alex. Yeah. So this one year has been quite tough on us and we have been learning a lot from Uncle Arthur Wong. PJ: Right. Um, I should mention of course that the three of them had their stalls next to each other: Smith Street Taps, and Uncle Arthur has Chinatown Sun Seng and then Yuting has Sutāchi, which sells Japanese fusion food. Right? So if you are in Chinatown Complex, do stop by. But let’s start first, right, with you, Jialiang because as just another Singaporean, right, I have this sort of vague idea that the whole industry is in crisis, that rents are skyrocketing, that hawkers are leaving the industry in droves. That you can’t make a living anymore, that there are a lot of problems with how the whole industry is regulated. That the food quality is declining. How true is this stereotype? Jialiang: This stereotype is quite… it’s true, I would say, in terms of how you look at hawker centres today, turnovers and everything, it’s a very big issue in Singapore because what’s happening is basically, uh, the median age of hawkers is about close to 50, so half a century old, so as old as Singapore, as it is already. So when you think about that kind of age, like I always joke to my friends like, um, if you want to have hawker food, have it now because in 20 years everyone is going to die. It’s nothing. There really wouldn’t be much left in, uh, in Singapore that, um, so I don’t think it’s a very big exaggeration to say that the hawker industry is in crisis. So, you know, it’s quite funny because the people who are actually doing the work are saying “Please don’t be a hawker” and then we also have the people who are not doing the work, who’s basically saying “Yes, please be a hawker” and that’s kind of the, that’s where we are in terms of rhetoric. PJ: That’s kind of indicative, right? The people who are the ones doing the work, are the ones saying “don’t get into this industry”. Jialiang: I think everyone will tell you that this industry is a bit warped. It’s very hot, hard to make money, so to speak. Um, for me that’s one part. The other part is also institutionally, how we have structured hawker centres. Hawker centres have never been a profit-making enterprise. That’s something that needs to be clear. Jialiang: Hawking. Hawking should be the right word. Yeah. To Hawk. Yeah. Okay. Never mind. Jialiang: Yeah I would call it hawkering because how Singapore has developed the… has dealt with the problem of street food is rather unique. As I tell a lot of people, street food is always a nuisance and a hindrance when states modernise, because when you think about in America, you know, even in, even in other parts of the world, even in Europe, you know, how street vendors were treated was essentially they immediately were chased off the streets and if they didn’t move into private property, and so on and so forth, they couldn’t practice their trade, so to speak. And so that’s kind of interesting for me because street food is not necessarily an Asian phenomenon. Street food is basically all around the world. When you look at France in the early 20th century, what they used to have was butchers that will go from town to town because meat was much more scarcely eaten then, and they’ll go from town to town during harvest season and then they would like say, “Oh, all these pigs you’ve rear right? I’ll slaughter them for you. I will cure the meat for you and you all can have a big harvest party and I’ll move onto the next town.” So that’s how, that’s how they practiced their trade as itinerant hawkers. So it’s interesting to see that, you know, that, that Asia has that kind of same… a mirror, you know, and it’s not… So that’s what I kind of mean by how hawkering is not unique to Southeast Asia and not even Singapore. PJ: Uncle Arthur, if I can ask you, you started on the streets, but now, but in ’83, you moved into a stall and now you’re at a stall. How have things changed? You’ve been doing this for 60 years. How do you feel things have changed? Arthur: Actually changing a lot. Youngsters, they refuse to take over the business and also, most of the hawkers also refuse to encourage them to come in. A lot of people now, when they do cooking, they don’t like doing it the traditional way of cooking. Seasoning, cooking hours, how you cook… they try and shortcut everything. So that’s why nowadays you can hardly find many good foods in hawker centres. They try to cut short. And actually it’s very bad for them. And one thing… is that when you move to a place, with heavy traffic, customer traffic, then they will do anyhow. Any way that I can cook it for you, then they will just cook. PJ: Why, why do you think this has happened? You know, why are hawkers pressured to lower standards like that so much now? Is it, is it cost? Is it about cost? Arthur: I think maybe how they want to do a cost, a cost cutting. PJ: And do you feel like, you know, your own costs from running a stall has risen a lot recently or about the same over time? Arthur: Uh, can be quite stable. Only thing is: electricity, gas, all these coming up. Other than that, rental, doesn’t harm me much. Yuting: For us, our rental is a totally different league. Jialiang: The new bidding system introduced over the past… after the 2010s. So basically every, um, every month, NEA will post a bulletin basically saying which stalls are available for rental. You use your SingPass and you bid for your store and uh, in terms of bidding, what you bid is completely up to you. So I can bid as low as a dollar and I can bid as much as $10,000. Who will do that? But never mind. There’s someone that has done that already. Uh, Chong Pang right? That’s it. Yeah. It was in the news. It was in the news about, about a month ago. $10,000 for drinks stall?! With my, with my hipsterised beer stall, I can’t even pay a $10,000 rent, don’t need to say about them. Yeah. Um, so, so, so that’s the new change. Uh, so, like all good businessmen, we’ll not talk about how much our rents are, but I can safely say that Uncle Arthur’s rent is 25% of what I pay. Jialiang: Around the same, right, I would say? Yuting: I think my rental is higher than yours. Jialiang: Yeah I think so also. [laughs] I have a lot electricity bills, but I think so also. So yeah. Uh, so, so, so that’s kind of the difference in terms of… it’s like a legacy issue. PJ: He was grandfathered in. Jialiang: He was grandfathered in. It’s very hard to remove because once you remove, all these hawkers who are basically at retirement age will just… why would they bother? PJ: Yeah, so why did this change happen then? PJ: …but you have chosen to give up an office job to become a hawker. Yuting: …because I have a different dream and passion, because I love cooking, eating and I want to know more about, um, how to, how to be, how to bring my food and my cuisine to people who are less privileged. Because in restaurants people are paying a lot more for the same kind of food that I’m actually serving here. So we want more masses of people, people with a lower income who are able to try food that are actually being served in restaurants. So actually, Alex and I were previously from a Italian-Japanese restaurant. And from there we learned the skills, the craft, so we were thinking that why, why do people need to pay so much, just to enjoy all this fine dining kind of cuisine when in the hawker, we can actually do the same. And the reason being that… why people are paying so much is because in fine dining restaurants they are paying for the ambience, the aircon and the rental of the restaurants, but in hawker, because the rent is lower, so we are able to also provide like similar style cuisine or food to these people but lower prices. So that was our initial point of thought when we started up this, uh, hawker. PJ: I’m, I’m very struck by what you’re saying about providing food to the people. Right? And it seems to me that when I think about hawker centres, it’s a social good, right? You want to have cheap rents in order to provide your people with affordable food. It’s kind of like no different from subsidised healthcare, subsidised public transport or you know, these are public goods, right? Or the government paying for, for security, our police, our firemen, these are public goods, right? Subsidising education. But if it seems like from what you said Jialiang, this is not the case anymore, right? So Uncle Arthur here has a subsidised rent, but you guys don’t. And when did this happen and why? Jialiang: This, okay, this happened in the early 2000s and basically they were trying to switch the schemes, and remove all vestiges of rent control because I mean, what happened in the early 60s was that a rent control law was passed, just to prevent landlords from profiteering, uh, especially in the city area. So that law kind of influenced a lot of, uh, how a lot of property that we see now, that we take for granted, for example, hawker centres. So when hawker centres were started up, were conceptualised in the 60s. Uh, for me what was interesting was that this is a solution that no other country in the world has done in the sense that, uh, when faced with a population of itinerant hawkers, what is the solution? So in most developed countries in most, uh, modernising states, uh, what the solution was, is exactly what we see it in Thailand now where they basically just rule by… they just use enforcement and they prosecute and they say, look, we want to clean up the streets. So that’s the common narrative, we want to clean up the streets and because we want to clean up the streets, therefore we have to chase street hawkers off. And this is, this is, this is repeated in so, so many countries. And there are, there are reasons for that. Hygiene, cleanliness, the need for these hawkers to pay rent, so to speak and, and paying rent in and of itself, you know, you generate income for the state. So that’s kind of the situation that Singapore was faced with and Singapore had a very radical idea. It’s radical because when you think about it in the 60s and 70s, right, money was very tight to come by, there was a huge construction boom for HDBs, to make sure that everyone had a comfortable living to be in. And that is quite interesting because what happened is that—okay for everyone with context that noise is basically a wok—the thing about this is that what happened was that no, no sane government would say, okay, for these streets hawkers let’s waste a lot of money building huge hawker centres and we’ll house them in these hawker centres. That’s why it took so long to complete as well because that project started in the late 60s and was only formally completed in the mid-80s. So that was the time when they housed everyone into hawker centres. Uh, and this is a radical suggestion because what basically this is saying is that it recognises hawker food as a space for providing cooked food to people at a reasonable price. And it’s a reasonable price because rent was controlled at that point in time. And because rent was controlled at that point of time, what is happening is basically: you have hawkers who make their living, and in many cases, made their fortune. I just want to also say that, making their fortune at that point of time is very rare. We’re looking at like 10% of the hawkers made their fortunes at that point of time. PJ: And this is the 80s? Jialiang: This is the 80s. Yeah, this is, this is very, very long winded. So please bear with me, everyone. It’s very, very jialat. So this is kind of the historical background in which hawker centres were created. At the same time, Singapore went through a second round of industrialisation in the 80s. We built things like the semiconductor industry, you know, so more higher-value industries rather than in the 60s and 70s like tailoring, construction, so on and so forth. So these more higher-value jobs created disposable income for a newly minted middle class, which meant that a lot more of them could enjoy having food outside, and have more luxurious food. And at that point in the 80s, you don’t, you didn’t really have, um, air-conditioned places. How many of them were there? There was one in Katong, one in Orchard, Yaohan, and stuff like that. So these spaces were very few and far between. So if you wanted to eat out the only option that most people had were hawker centres. And so what happened is basically that the hawker industry experienced a boom at that point in time. And we think about the age of who grew up at that point in time, it’s basically the current generation of policy makers and the current people who are in the government, who think of the hawkering trade as the good old days. So nostalgia kicks in lah. But when you look at it now, you have so many more… there’s a mall in every neighbourhood. Those all tend to be built on top of MRTs. So there is a natural catchment already. That’s why you come out the MRT, you go into a basement, you reach a mall already. And for most people, why would you want to eat at a hawker centre? You have to extract yourself from the aircon place and you’re going to makan somewhere else. So a lot of people don’t want to do that. And all the young people don’t really want to do that. One of my friends brought her colleague over, who was like 18, 19 years old. And when she came over here, she was like “Wah, I didn’t know hawker centres got so much food!” Like, for us, this is so bizarre, right? Because none of us, um, think of it in that, in that way. So, so we tend to have that kind of myopia in hawkering. PJ: Okay. So to summarise, what you’re saying is, when we think of the Golden Age, when we think of hawker centres, what we’re thinking of is a really specific period in the 80s, right, not the 60s or 70s. And then after the 80s, things also have changed drastically from, especially since the early 2000s. So that’s the first thing. And second thing, it sounds as if what you’re saying is that hawker centres used to have far more of a monopoly of choice, that if you wanted diversity of food, you went to a hawker centre. But today there’s so many different options and hawker centres are just one of many. And then the third thing is because of all these different financial pressures, the quality of hawker food, or at least the perception of their quality is going down. People don’t go. There’s more cutting corners to survive as rents are rising. Jialiang: Yeah. I mean, that’s kind of it. I’m more interested… because Arthur was a hawker in the 80s, so the customers last time were more willing to spend, right? Arthur: More willing to spend. And also their house, all the overheads are not so high. More cheaper electricity, everything more cheaper than now. And one thing you must know, in our city area, the hawker centres, we only can survive because of the office crowd. If we don’t have office crowd, we are very hard to survive. And for the town, they go to the hawker centre is because, when they go to the market, then they eat food in the hawker centre. Otherwise they wouldn’t, they wouldn’t go there to eat. Most of them will go to aircon shopping centre, or maybe they will cook at home. Yuting: The issue is that because of the convenience of the integrated malls here in the CBD area, so most of the white-collar staff, they will usually just stay in their buildings and just get the food that’s below their offices and they are not so willing to walk over to hawkers where it’s hot, crowded, and stuffy. But the only chance that they will visit the hawkers is that if they need to do some marketing for their groceries, then they will walk by, do some grocery shopping and then grab some food from the hawker. And on top of that, I think nowadays customers are less patient about waiting for food. They want everything to be fast. So perhaps that’s one of the reasons why hawkers are also cutting corners, taking shortcuts, not only to deal with the higher, the rising costs, but also because of the attitudes of the customers. They want us to give fast, good and cheap food which is very difficult for all hawkers. PJ: You can only do two out of three, really. Right? 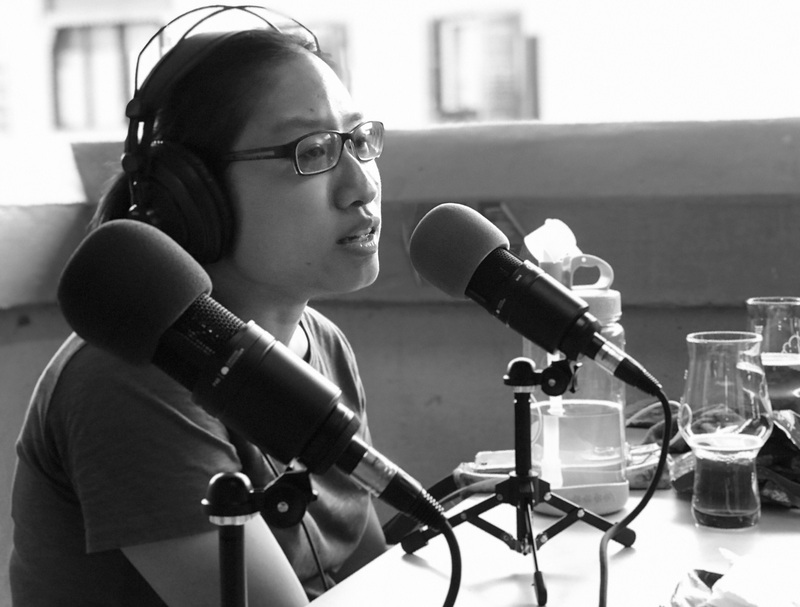 Yuting: So I think that’s the, that’s, that’s the many of the pressures that hawkers face. The rising costs, the attitudes of the customers, and more and more integrated shopping malls and offices. PJ: Can someone explain to me—I’m not clear in this—what’s the difference between a hawker centre and a food court in a mall? ‘Cos the food court in a mall is set up kind of the same way as a hawker centre, right? You got stalls, you have tables, but it sounds like there’s a difference. Arthur: They go there to eat in comfort. PJ: Is it just that the rents are a lot higher in those places? Yuting: The rent is about three times higher than ours. Yes. PJ: Three, three, three times?! Yuting: At least three times higher. Jialiang: I just want to jump in. The new social enterprise hawker centres have similar rental schemes as a food court. So that’s why there’s so much backlash about it. Also in terms of food courts, there really is… there are two systems lah I would say. So the first system is, you are, let’s say you are a food court operator. And what happens is basically you hire all the staff in the food court. So basically wherever you spend money, right, all of the money will go into a main parent company. So places like Food Republic, which is under the BreadTalk group and so on and so forth. All the stalls are basically licensed from these various different places, and then these places supply the goods from their central kitchens and basically whoever who is cooking there is trained by these vendors and these vendors, basically have a supply arrangement with food courts. And all the staff is under the Food Republic payroll. So that’s one system. The other system is… and this is a more traditional landlord situation, where people go in as independent hawkers and then they pay rent and they set up shop. The problem is food courts, like malls, they have certain obligations that they have to keep to. For example, you have to open your stall from 10:00 AM to 10:00 PM, or you have to, or if you are operating a certain kind of good you have to open your stall from very early or very late. So that’s kind of the difference in terms of a food court. But the most important difference is rental. In many cases you’re looking at… rental at a centrally located food court store, you’re looking at about $4,000, $5000 before utilities. And a lot of people like to joke “Wah Orchard Road the per square foot, very expensive.” And I always tell people: there is no per square foot more expensive than a hawker stall like a food court stall, because it’s the one, it’s like 300 square foot, at a max, paying $5,000. It breaks down to about $15, $16 per square foot. So you can imagine. It’s very difficult to explain to policy makers because there’s this imagination that you’re looking at a situation where food courts and hawkers are not efficient. That’s, that’s a huge part of the conversation: hawkers are not efficient. But it’s not the case. Like what Arthur said, cutting corners can only be possible if you have centralised kitchens and factories making these things that allow you to cut corners. One of my friends who is a fishball factory owner likes to joke that it’s very obvious when there’s a recession, uh, and this recession will be predicted three months before anyone else, uh, when hawkers start buying his cheapest fishballs, that’s when the recession is coming. So that’s kind of, that’s, that’s, you know, there is no business more efficient than hawker stalls. So, so that is difficult to explain. PJ: I mean, when I look at, uh, you know, the kind of output that your stalls have and really it’s just each of your stores has two people and that’s it and you’re producing so many meals. Jialiang: Arthur can share more about like, uh, like, what is the most, is the biggest change in terms of like what it was usually done by hand and now it’s done by a factory? Arthur: I think that by hand you have to take more time. You have to put in a lot of effort. I think the food taste will be more, more different. Arthur: …you know, some of the fishball noodle stalls, their standard also dropped because they start buying fishballs from supplier. When last time they used to make the fishballs by themselves. It’s really different. PJ: And that takes a lot of time right? Arthur: Takes a lot of time. PJ: Do you still make all your own, you know, cut all your own ingredients? Arthur: I cut my, my own ingredients. I do shopping my own. PJ: How much time does it take every day to just prepare the ingredients? Arthur: Actually I take about nearly three hours. PJ: So uncle, tell me about your day. Just to clarify. So what time do you wake up in the morning? Arthur: I go to market. PJ: Okay. And that’s how long? Arthur: Take about one hour, then come back, cut the fish, clean up the fish. PJ: Right. So that’s about three hours. So when do you come here? Arthur: I reach here at about 11. Start cooking. PJ: And then what time do you open? PJ: Oh, okay. Okay. So you, you start cooking but you open already ready at 11? Arthur: Yeah, because I have my ingredient all prepared. PJ: Oh, okay. Okay. Then you said most of your customers are lunchtime. So that’s roughly 11 until about…? Arthur: 11. Until about 2:30 or 3. PJ: But then you’re open the whole day? Arthur: No. I open until 5 o’clock. PJ: Okay. Okay. And then after that you’re done for the day. Arthur: I’m done for the day. And uh, we, uh, we start the preparation for the next day. PJ: Oh, okay. Okay. When you say preparation for the next day, that, what is that? What are you doing? Arthur: For our food… So after that, when we close, we have to sort out everything like veggie, we have to sort out. Those not good, we have to cut it away. Jialiang: I think, I think it’s like ingredient preparation. That’s why he can stop at 8. So, so whatever that he buys in the market at 8am on that day itself is for ingredient preparation for the next day. So Uncle Arthur usually stays until like seven. Qi tiam, pui tiam. Jialiang: Around there lah. So ingredient prep is about from five to eight. So he only, he only leaves at about nine. Then the day starts again at eight usually. Uncle Arthur’s schedule is very relaxed already because he retired, retirement mode already. Children all grow up already. So, so I mean don’t… the reality is that a lot more hawkers who still need the money have a more punishing schedule. And if you’re going to do traditional food like this, that is the kind of schedule, this schedule is the dream, the dream. PJ: Yeah it does sound okay. Jialiang: It sounds like a 10-hour job but, but most hawkers will have to do like a 14, 15 hours, at minimum. PJ: Yeah. What about you, Yuting? What is your schedule like? Yuting: My schedule… Usually a day for us starts around 10:30am. Somewhat like Uncle Arthur. Usually after lunch hour we’ll be doing preparation work for the following day. Then that’s when we also do… then at the end of the day, we also do a stock check on our food items and our ingredients, see what do we need to purchase and order for the following day so that we can continue to do prep and make sales. So the difficult part about being a hawker is that we have very little and limited storage space because of the small kitchen that we’re having so we need to optimise our chillers, freezers, and our storage space. We can’t hold too much in our kitchen and then we need to manage our storage space as well as ordering goods. PJ: It’s a complicated sort of, just-in-time logistical operation as well. Yuting: Yes. It’s different from a big restaurant or hotel or food court where they do all the centralised ordering and marketing for each and every stall. So actually each and every hawker stall runs like one restaurant where they have to manage their inventory, food supplies and even cutlery and things like that. So for a hawker to run successfully, they have to manage many things at one go. So they don’t only manage their customers, they have to manage the logistics, the inventory, the food items, the disposables, the plastic bags and things like that. So it’s really um, small little business, so unlike for people who are working in the food court, they are just employees. So to them for every day when they go to work, it’s just to cook the food, or serve the food that’s already, has been, already been pre-prepared for them from the central kitchen. But in hawker you have to do everything by yourself from step zero all the way to you serving the food to the customers. And for us, there’s only two of us, so at times it’s quite tough because um, even though you have volume sales for us to do, but we’ve only two manpower and limited storage spaces. So there’s only so much we can do to earn our sales and revenue everyday. So sometimes people might be asking us why, why do we close early? Why didn’t we prep so much food when you know that it’s Friday night and things like that, but have they ever thought of the difficulties that we face when we are managing our storage, our chiller space and things like that. It’s not that we don’t want to do the sales, but it’s because we’re having some limitations. That’s why we are facing such difficulties to make lots of revenue. PJ: That makes so much sense to me. I mean, I’ve heard the stereotype, you know, of a, “oh that stall, they just want to sell enough. You know, they make enough money, they’ll just close shop and go home. They don’t want to work hard”. You know, but when you explained it that way, I realise you need to close. Otherwise you won’t be ready for tomorrow and if you don’t, if you run out of stuff, you literally run out stuff because you only have so much storage space. You can’t, like, build up a buffer. Yuting: Yeah, that’s why… sometimes when people say things like, “oh, they definitely have made enough sales for the day. That’s why they are closing.” When I hear things like that, I feel quite disheartened because the thing is that who, who in their right mind doesn’t want to make sales, it’s not that we are trying to be difficult, but it’s because of our storage space and us ordering the inventory from suppliers. Sometimes it’s difficult because we need to hit the minimum order when we order from suppliers. So maybe the most that we can order from a supplier is probably once a week because of the minimum order sales. Then, when just happen for that week we run out of this item, then we have no choice because the next order will only come next week when we order from the supplier. So they have to understand that we are not like a big restaurant or hotel where we have space to stock up a lot of food and they have to understand that these are the limitations that hawkers are facing. It’s not that we don’t want to provide them with all the items that we have, but because of these limitations. People have to be more understanding. PJ: But it sounds like, so we’ve got all these factors that we’ve talked about making life extremely difficult for hawkers, you know, increased competition, the changing nature of the industry. But what we also have is increased experimentation then because it seems like policy makers are trying different ideas. And, and so Jialiang, this social enterprise, you know, you mentioned that they are very expensive. The rents are very high and that doesn’t make sense to me. Can you tell me about social enterprise hawker centres. Why are they so expensive? Jialiang: I think Yuting can answer more as well because I don’t really have hawkers who are stupid enough to go into the Social Enterprise Hawker Centres and you know a few, right, who are there? Yuting: Actually initially we were looking at the hawker centre that is in Pasir Ris that newly set up this year, beginning of this year. So we went to check it out and we went to get an application form so we were very hopeful at the beginning because since we are looking for space and Pasir Ris hawker seems to be a good location because they differentiate between more hipster food and traditional hawker. So we wanted to be, we wanted to get a stall at the hipster level. PJ: What’s the distinction between hipster food and traditional food? Jialiang: It’s irrelevant. It’s pretty pointless because uh, when you think about it, it doesn’t really matter. It’s basically providing different cuisines and different price points. Number one. Number two is also that, this isn’t a new thing in terms of like new cuisine of sorts entering the market. When you think about it, a Japanese food shop in hawker centres, like no one says, no one talks about how they are hipster food, right? And they sell like bentos and stuff like that. And its very Singaporean-ised Japanese food. There’s a soup, there’s rice, there’s something fried, stuff like that, you know. The only way that they look, they look like a hipsterised stall is that, you know, they sell Japanese food, and their rice is short grain rice. PJ: Wait. But this is a technical category that Yuting, you were saying the Pasir Ris social enterprise recognised the difference between. Yuting: So they have two categories. One is traditional food, traditional hawker food as they say. Yeah. And the other one is hipster fusion. Yuting: Actually they didn’t really give a definition, but the rental itself, there’s a difference. Yuting: I’m not so sure about what’s the difference in the rental rates, but I know that the level that is selling the hipster food, the rental is a little higher than the one selling the traditional hawker food. So at the time when we went to get an application form, which cost like $10 for one form. PJ: For a form? You have to pay for the form? Yuting: Yes. We have to pay for a form, and that’s even before us registering ourselves. So we took the form, then Alex and I sat down and we read through the whole form. So the most shocking thing about the form was that on top of the rents that we had to pay, we had to pay the usual cleaning fee, we had to pay for this sales and marketing fee, and we also have to pay for this electronic cashless system device—and this is a monthly fee. So on top of the usual rental cleaning fee and such, we have a sales and marketing fee, plus a electronic cashless device monthly fee that we have to pay, and all this excludes GST. So you have to pay additional GST. And on top of that, we have to pay a fee to purchase the cutleries that are provided by the company itself, the social enterprise. PJ: So you can’t bring in your own cutlery? Yuting: Yes, we can’t bring in. And you have to use those that are provided by them. And there’s a small little clause saying that um, this cutleries and bowls and plates are subjected to changes according to the management. So probably if they say that within one year later, they want to change all the white plates or bowls to black plates and bowls, we have to bear the cost and change it to the black ones. So these are one of the reasons why we didn’t sign up for… Imagine you have a, let’s say, a NETS machine, I have to pay a monthly fee for having that device at my place. But what are the chances that people will use that device for payment? Jialiang: I also just want to say NETS is giving these machines out for free for the next four years. So it’s quite brazen for them to charge for these kinds of things. Um, the POS was what $150, right? Was it $150 a month? Yuting: $150 a month. Just for that device. PJ: The device that NETS is giving out for free? Yuting: And that device, when we, when we asked them, so does this device come with a POS system where we can actually record our daily sales? They say no, this device is plainly one that does the cashless payment. So to us it’s like, oh, this device, like, it doesn’t even help us in recording our daily sales. And we have to give a monthly rental of $150 and in addition there’s a GST charge. And then, further on, there are minimum hours that we have to open daily at that place and we have to work for at least six days a week and if we were to go on a long leave, like if I were to take a holiday break, I need to write into the management to apply for leave. And on top of that, um, when we, when we need to change menu, when you want to change menu to our food, we have to write a proposal to change our menu. Arthur: And, of course, subject to approval. Yuting: That’s right. On top of that, on top of writing a proposal, menu proposal, we have to provide a free food tasting for the management. Yuting: Yeah. In addition, in our menu, we have to have one food item that is cheap, which is probably around one item that is between $2.50 to $3.50 Sing dollars. We have to have that one item that is priced relatively low and it has to be on our menu. Jialiang: I, I just want to say, uh, in, in, in any hawker centre around Singapore now, I will pay you if you find me a $2 to $3 priced dish, because that price was in 2006. Yeah. So basically we have a situation where you have a price that has stayed constant on one of the largest inflationary forces that we use in Singapore to calculate our inflation rate. Cooked food is the largest inflationary resource. We’re looking at every quarter is like a 2.5 to 3% kind of situation. So basically you’re saying that from 2006 to 2018, have no price increase, you know, we can keep food at $2.50 to $3. Yeah. So, so it’s quite rough lah. Yeah. Yuting: So with all these conditions, Alex and I didn’t choose Pasir Ris Hawker Centre as our location. That’s why we ended up in Chinatown Complex here. And actually if you really visited the Pasir Ris Hawker Centre, you will have noticed that a lot of the stalls are no longer operating. PJ: Well, I’m not surprised. Yuting: Most of them only lasted for three months. So we are quite happy and glad that we have lasted longer than them. So this is the future of Singapore hawkers. Jialiang: This usually comes as a shock for most people because they don’t see… Because the rhetoric is very different in Parliament, right? Because the rhetoric is all: oh these new management companies provide vibrancy, provide new exciting menus, so on and so forth. But the reality is that this is not the case lah. They open with a bang, and in a few months time, most of these hawkers—a lot of them are first-time hawkers—and because they are first time hawkers, they don’t know the full economics of what makes a hawker stall work. So they enter into these arrangements and, and of course they bring in their own food, and their own interesting cuisine. Now my problem with that is that, because they are inexperienced, they don’t count the costs as clearly as they should. I mean, Yuting has been an auditor for six years. So for her, when she looked at it immediately, she’s like, “Wah, warning flag number one, number two, number three, number five.” NETS is giving out these machines for free… Arthur, you have one right? Arthur: Yeah I have one. Jialiang: Four years, no fee, right? You see what I mean? So on one hand we have this and on the other hand these new hawker centres, you know, grandfather in… the other thing that was not mentioned about these social enterprise centres is that they tend to restrict who you can buy things from. For example, in the Pasir Ris one, you can only buy gas from NTUC who, for whatever reason, has a gas company as well. And the last I checked, their gas is a bit more expensive then most of the suppliers around. Do you buy gas from NTUC? Arthur: I don’t buy from NTUC. Jialiang: Exactly. Yeah. So, there is that element. It’s what sociology likes to call a double bind, right? So you have, you have… you’re faced with higher rents, you’re faced with longer hours, and you’re faced with a more mature and sophisticated market in which it’s very hard for you to earn your keep. And on the other hand, you have the situation where you have longer working hours and you’re faced with having to sell one item of your menu for cheap, right? That was the lynch pin of the National Day Rally this year, right? Like the one item will keep prices affordable by having that one item for cheap and basically that seals, for me, that’s, that really puts the final nail in the coffin for the hawker trade. Because what you’re saying is that… If you go and look at the Google pages of all these new social enterprise hawkers, right? You look at the reviews. The reviews are very indicative of what people are eating because they’re saying this place is cheap and affordable. Very good. I can buy laksa for $2.50. All the comments are like every… it’s not every once in a while. It’s like a majority of the comments are boasting how cheap the hawker food is. So because of that, you know, you create the situation where people who can perfectly afford paying for a plate of food at $4, $5, right, they are of course choosing the cheaper variety of foods. And when you look at your revenue spread, the food that is being asked for at $3, it’s not going to earn you much because every time you sell a meal, it’s an opportunity cost. So that guy can either pay $3 or the guy can pay $5. And most Singaporeans will just pay the $3 option. And of course you want to have quality, but the quality is still the same because they have to use the same soup, they have to use the same stock, they have to use the same ingredients, just the volume and the quantity. That’s all. So when you look at it in that perspective, then things are a lot more different, in terms of the value that these social enterprises are providing. Basically what’s happening is that we are building a culture of cheap food on the backs of hawkers. PJ: Wow. You know, we hear all these stories of, you know, Singapore doesn’t have entrepreneurs, doesn’t have risk takers, but what I’m hearing is that there are plenty of people who are very interested in entering this industry as small businesses and in, and the bureaucracy, the government policy, really government policy, is choking the life out of them. Right? And then they’re forced, they’re kind of exploited and, and so because of that rapidly driven out of… so why, so the problem then is, would it be fair to say the problem is government policy, that they don’t understand how this works, how the whole industry works? Jialiang: So every few years they have a panel for hawkers, to talk about the hawker trade, and every single panel from the first—and now we’re at the third panel—none of them are hawkers. No single person sitting in that panel is a hawker. You’re looking at supplier, you’re looking at factory owners, you’re looking at landlords. So no one in any committee has sat and been a hawker. I’m reasonably confident in that statement because I’ve been looking at the names of who is in these committees and none of them are hawkers, you know, no one knows why they’re there, except them. And this social enterprise hawkers, was a project in the 2.0 report. Oh, I don’t know why they put up a two-point-oh, because it’s one, two, three, but you know it’s governance, it’s government bureaucracy. It’s got to sound cool, right? So you put 1.0, 2.0, 3.0, for no reason. What’s the decimal point for? Nothing. So the 2.0 basically said that we should experiment in different models of management through the use of social and nonprofit social enterprises. Now the problem is that to be a social enterprise, there is a very low bar in Singapore, in the sense that you can be a social enterprise simply by calling yourself a social enterprise and having targets—that are not enforced by the way—to be socially responsible… now how you’re going to be socially responsible is completely up to you as a social enterprise hawker, whatever that means. Are you nonprofit? Yes and no, because as a cooperative, you can be profit driven, but you can promise to move those profits to the benefit of the general public. And in Singapore, when you’re a cooperative and you want to move these profits to the general public, right? It’s not a contract, it’s not audited, it’s a pinky promise. You know, like, “Hey, like, you know, I, I promise that I will spend this amount of money on a certain amount of people”, like that. So that’s all. That’s all you need to be a profit-making cooperative in Singapore. So all these factors coming into play basically means that if you are managing a social enterprise, what’s going to happen is that you create an entire new layer of middle management, you have to compensate the new layer of management. The much vaunted productivity gains are very marginal. What they gained in productivity is basically buying plates and cutlery and centralising the cutlery. But this doesn’t necessarily translate to a cheaper cost for hawkers. So some… how much was the dishwashing payment at Pasir Ris? PJ: But it sounds like this, this is a broader problem in Singapore that we keep seeing, right? Labour is highly, highly regulated. Capital is unregulated. And that leads to a scenario where capital is able to easily exploit labour, because labour is not only in a position where it doesn’t have bargaining power and protection from capital, but the government itself is also oppressing labour. Jialiang: Yeah. So Yuting, bo lui ah? Yuting: So for dishwashing service, it’s $180 per month, subjected to GST. Arthur: That’s inclusive of a table clearing? Yuting: No. Table cleaning services is $550 per month. And on top of that, there’s also the service and conservation charges, that is $350 a month. Jialiang: Just on a… how much are we paying here for table cleaning? Sa pa right? Sa pa gor? Arthur: About $300, $300. For the takeaway stores, like your char kway all these, I think about $100 something only. Jialiang: I also wanted to say that yeah, we have a merchants association at Chinatown Complex. So we contract and hire the cleaning agency, and then we just split the cost equally amongst all the hawkers in… you know. But obviously there’s something up lah, in this situation when you hear about… yeah. Also I just want to say that $850 is not a normal quote. Outside in… If you’re a high volume hawker stall, and there are a few in Singapore, most of them have outsourced their cleaning to these kinds of dishwashing companies. So every morning they, through the logistics network, they send blue boxes of washed cutlery and then you just use those cutlery, you pack them back in those blue boxes, and then they send back. A contract of that, it’s like $500, $600 a month and you are talking about high volume stores. So basically stores that have a low margin and churn like 300, 400 plates a day and their dishwashing cost is $500 to $600. It’s a reasonable cost because if they had to hire a store hand to wash the plates, right, you’re looking at a $1200, $1300. Arthur: And most reasonable is that they don’t charge you for the crockery. You bring your own crockery. Yuting: They provide crockery. So you don’t need to purchase the crockery and they provide you with that cutleries. But here you need to purchase all the cutleries, and you need to pay for the dishwashing. But the thing is, $850 per month, if for example, if your sales is not as high volume as the usual hawker stalls, $850 a month is a lot on your side. Imagine you don’t utilise the centralised washing system. You wash only your own plates. Let’s say daily I only sell a hundred bowls and only spend on electricity and water bills to wash these hundred bowls. You will not amount up to $850. So I mean, for a new startup, a new hawker, $850 per month is really a lot. I think they really need to relook on this dishwashing services. It will be better and fairer to be charged according to the number of plates and according to the sales that they are doing. I mean, because not everyone has the same volume or sales every day and every month, so it’s quite unreasonable for you to charge a flat rate of $850. Arthur: You mean for the washing the crockery and also the table cleaning? Yuting: Table cleaning, if it’s a flat rate for everybody, it’s still quite reasonable because they ensure that all the tables are clean, so that customers have got a place to sit, but the dishwashing service, if we have high volume of sales, $850, yes, is not a problem, but if I have low sales every month, giving a flat rate of $850 per month is asking too much. Jialiang: Yeah it’s rare to see PJ have no words. When he usually has a lot. PJ: So what can we do? What’s the solution? Jialiang: Don’t have. I’ve been thinking about this quite a lot these days. The simple and bare fact is that hawkers as we understand and know it today is really an endangered species. Because what’s happening is that you are… The proposition is simple. You will need to sacrifice possibly a very well paying job, relative to ours, in most places and enter an industry that has very high risk and low returns. Work hours that stretch from 10 to 16 hours a day. Make food and sell them at a reasonable cost, but they can’t be too expensive because Singaporeans don’t pay for that amount of food. And at the same time you have Singaporeans being lulled into a sense of complacency because all the old hawkers that are sticking around, they’re not sticking around because they’re making a lot of money from it. They’re sticking around because their kids have all grown up, they’re in different industries. Arthur, ni er zi zuo shen me? Arthur: Shen me zuo shen me? Jialiang: Your son and daughter, what they doing? Arthur: My son is doing media work. My daughter is working in the logistics company. Jialiang: Yeah. So, so that’s kind of the situation because what’s happening is that that solid, lower-middle, middle class job that you could get and be as a hawker in the 80s is no longer a reality. So, you want to be a hawker in this day and age, right, you have to have a growth plan that allows you to franchise, that allows you to have a central kitchen, that allows you to have… Now this is, again, you might not be decreasing your food standards, right? But that’s the entire reason why this kind of food is very, very rare to find because the pricing proposition is just so difficult for you to convince your general public. It’s tough. Even on the governmental side, it’s tough to convince them. And I’m like, “Yeah, you can count value, you know, it’s not, you know, the, uh, you can count value and by the man hours that are put in, what kind of ingredients are you… These are things that can be counted, right? But what is happening is that, there is a sea change in how we think of food in Singapore, and in hawker centres. It’s important to note how the language has changed for hawker food. In the 80s and the 70s, no one would tell you, you eat hawker wah so cheap, so good. No. Hawker food was expensive then. You know, it was not a… it was not a point in time where people had the disposable income to randomly spend 50 cents on char kway teow, you know. And that’s the difference, I would say. We expect too much of this hawker industry, and we expect too much of them to cover the gap… that is essentially, when you have massive income inequality, when the rich are getting richer, the poor are getting poorer. How do you provide for the poor? One of the ways is food stamps, right? But the ideological disposition for food stamps is not there in Singapore. So what do you do? You enforce that new hawkers have to have a menu on the item that $2.50 to $3. So you can… yeah, it’s tough. 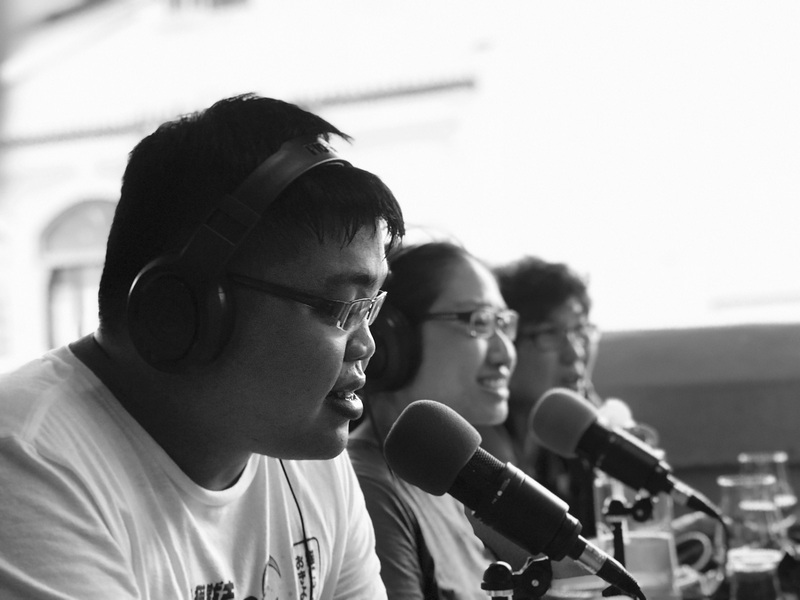 PJ: It sounds though that there, I mean if, if the government went in and recognised hawker food as a social good, right? Would that be a solution or would that just be a distortion of the market? And then, we then say, restaurants with aircon in their own, you know, lots, would they then complain that, oh, we’re, our market is being cut out from under us by the government supporting hawker centres? Jialiang: I’ve to answer this, sadly, sorry, you have to listen to my voice for another five minutes. I mean, this, this is the, the, okay… The situation is that hawker centres have never been independent, subject to market forces. It’s never been based on laissez faire economics. It’s never been a situation where there is no government intervention. It is heavily government… it’s heavy government regulation and heavy government intervention that has led to the hawker trade being what it is today. No one can deny that. If it was like a traditional landlord agreement, we will not be seeing what we are seeing today: the vibrancy, the amount of independent hawkers, we won’t see it today. To say that, letting the market do what it needs to do will be very disastrous for the hawker centre. And the problem is that where we are now and where the Singaporean government is at now, they want to do that. They want to be a bit more hands off in managing the hawker centres, right? That’s the reason why despite having a perfectly fine system, with NEA, that allows for you to… there’s a system, basically, in place, for managing hawker centres. They want to outsource it to these companies. The hopes is that outsourcing it to these companies will allow you to take away a lot more work from NEA. And that’s, you know, that’s a very recurrent logic in the system. The answer is not as clear as it is at this point of time. In general, what is happening is that, it’s very hard to give that proposition to most people, especially when you look at the prices of food in these massive integrated malls. You can get a laksa for like $6, $7 and for most people they can afford that $6, $7. Now the question is, do you want to walk five minutes to the nearest hawker centre and just to save $2, $3? And a lot of people don’t want to do that as well. Arthur: Anything you want to say about it? Or how to survive in this hawker centre? PJ: So Yuting, why don’t you give us some hope? How are you going to survive? Arthur: What do we expect the government to do to make… we hawker centre, we hawkers can survive? Have you any idea? Like for me, and you, is two different categories. Because my rental is subsidised, but your one is market rate and market rate can be up or down the next year. Me, uh, can be said, quite stable. So there must be a way to survive. Jialiang: No lah, the way to survive is here, with Arthur. Oh, we just need more… the question is not less governmental intervention. The question at this point in time, is more. So you can’t have the cake and eat it, basically. This is a situation that the government wants. So they want both cheap hawker food, but then they want to peg rents at market rates. They want to outsource to social enterprises that are clearly not social, nor enterprising. And they want a certain image of hawker centres in Singapore for whatever publicity that they want to use on the global stage. Right? So the answer is very clear. The question is whether there is enough time to reverse that situation. That’s really what this is all about, right? Preserving hawker centres will take a lot more than just political speeches on building more hawker centres. PJ: I feel like this is actually a microcosm of the government’s policy as a whole because in so many areas they demand, you know, they want affordability for Singaporeans. They want a lower living costs for Singapore, right? You look at HDB for example. But then at the same time they want market forces, right? Because there’s this strange perception that market forces create efficiency, you know, and discipline. And this is impossible to have because market forces will drive price the point of, you know, market forces want to make profits. So this seems to be the central quandary that Singapore is caught in today. Yuting: The government needs to do more about understanding the problems and the issues faced by hawkers, especially young hawkers, who are trying to carve a business or a niche market in this hawker business. They need to understand what kind of difficulties financially and in terms of crowd flow and the kind of marketing that government is actually doing to promote hawkers to Singaporean. I mean with the cheap, affordable food, but you must understand that for hawkers to give affordable food, there are some things that we need help in financially. Like probably the issue of the rental, the dishwashing and the cleaning tables services. Probably if the government wants to really step in to help us hawkers. I think this three rental aspects, they have to do something to help us. PJ: So uncle, when you retire, what happens to your store? It’s no longer subsidised. Arthur: I won’t retire so early. Jialiang: Bo pian, bo pian, no choice. Arthur: You know, uh, if I retire, I don’t know what’ll happen to me. Maybe all the sickness will come to me. To keep going, I think I may keep on working. Jialiang: But that’s the point I’ve been trying to make. Because that’s a thing. Policy makers only see that all these old hawkers are still working, so on and so forth, their price is like that, why can’t other people’s price be like that? So on and so forth. It’s amazing. I don’t understand how they cannot think in dollars and cents. It’s very weird. But that’s what I mean. I always tell my friends, half-jokingly, you know, the hawker trade is a charity. They work long hours. There’s very little pay. Their margins are nonexistent. They provide food for the lower income groups. Sometimes they didn’t even charge them if they know their circumstances and their needs. It’s a charity! At this stage and at this point that when you look around and in most hawker centres and you look at the general age, you look at how long they’ve been in this business, you know, you just ask any of them what are the sons and daughters working as right now, you know, and you have a very clear answer as to whether they will come back and they will take over the store and they will continue what they’re doing because it doesn’t make sense in terms of being able to afford living in Singapore. It just starts to become very, very obscured in terms of value and everything. Arthur, your daughter, son, want to take over? Arthur: I don’t think so. But Yuting, will you be happy if the government were to lower the market rate for the hawker stall? Yuting: Of course. Of course. I will be happy. But if you seriously and honestly think about it, when you look at all these old hawkers, what they have been through, if they were to say that they are having good life now and all… But think about it, they have started this in the 80s and now we are in the 2010s. It took for them 30-over years to be enjoying good life now. PJ: I mean, good life is relative. Arthur is almost 70 and you’re still working 10-hour work days. Arthur: I enjoy good life because I got good neighbour. PJ: How is that… for a 70 year old person to be working 10 to 12 hours a day: that is not a good life. It’s only relative to the kind of suffering that everyone else is doing that it’s a good life. It’s not supposed to be, you’re supposed to be retired. Have your feet up. Go travel when you’re retired. That’s a good life. Jialiang: You remember “Passion Made Possible”? Yeah. So it all falls back to that kind of rhetoric, right? For me, how F&B should should look like if you want like a good model for stable, family owned small restaurants, right? You look at Japan. Like when you look at Japan, the food that they sell is not relatively… the cheapest you get is like 600, 700 yen. The reason is because, when the property bubble burst in the 1980s, Japan learnt a very valuable lesson which is that, if I want to move and I want to drive the economy, I cannot rely on property. And because of the property bursting in 1980s, what happened is that they have, they have been steadily adding in infrastructure over over the past 20, 30 years. So there has never been a shortfall of infrastructure in Tokyo. And what happened is that basically when you sign leases there, you don’t sign a lease of one year or two years. Your rent doesn’t change dramatically every year when you start to rebid for the store, like what we are facing in Singapore. What happens is that basically when they sign lease, they sign… Five years is a small lease, 10 years is the norm, 20 years is an outlier but still happening. So when you sign that kind of lease, right, it allows you to have a much longer term expectation of your returns and because landlords there know that if… they have learned and they have suffered from the 80s, the property bubble that happened in the 80s, most of them understand that the creation of a stable community with various businesses rely and depend on rents that are reasonable, that are long-term and that will allow any business owner to plan properly. And that is what is missing right now because of the ups and downs of the economy and so on and so forth. We don’t have a stable expectation of rent and that is problematic. So that’s why when people go to Tokyo and then: eat this ah, the quality is so good, why only 800 yen, why only 900 yen, why is it $10, why is it $12 only? It’s because that is because they have an expectation of how much things should cost in the next 10 years. Their major problem is settled. Rent is one of them. That allows them to have better projections, in a very general sense. PJ: Okay. So it’s, it’s almost 6:00 and our guests have to get back to work. The life never ends for a hawker, work never ends for a hawker. So I want to finish by thanking my guests, Jialiang, Yuting, and Uncle Arthur. Thank you. Thank you so much. And I want to encourage all of you to go patronise your local hawker centres and do come down to Chinatown Complex to try Smith Street Taps, Sun Seng and Sutāchi, all three of which are excellent, excellent stalls run by wonderful people and you know, if you have the time do ask them how things are going. Do tune in next week for New Naratif’s regular series on Southeast Asia, Southeast Asia Dispatches. And in two weeks time, Kirsten will be back and we’ll be back to normal. So, um, for… This is a rather depressed PJ, signing off for New Naratif’s Political Agenda and see you next time.